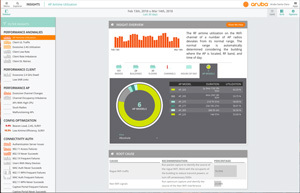 Aruba today announced NetInsight, a network analytics and assurance product that uses artificial intelligence to monitor and optimize network performance. NetInsight constantly monitors an institution's network and establishes baselines for normal performance. Its machine learning tools then tag deviations, analyze the impact and provide insights so that IT departments can identify problems before they impact users, according to information from the company. Because the system continuously learns and adapts to evolving network environments, it can address changing network demands such as new Internet of Things devices, roaming mobile devices, cloud services and more. In addition, NetInsight uses data analytics to anonymously compare an institution's network to networks at similar organizations or similar building types, allowing users to benchmark network performance and benefit from shared insights. "Today's digital campuses and hospitals are increasingly dependent on complex applications, smart devices and mobile users who expect to have connectivity everywhere," said David Morton, director of networks and telecommunications at the University of Washington, in a statement. "Using Aruba NetInsight, we have access to network data with flow visualizations and actionable analytics that help us make critical decisions about where expanded and new coverage is needed — such as outdoor WiFi for new construction. We can also validate the before and after impacts of network change so that we can proactively deliver the best possible user experience." For more information, visit the Aruba site.